Usually three weeks into the season there are still a number of teams in the Top 25 with obscenely lopsided win-loss records and still a handful of undefeated clubs. This is most certainly not the case this season. If early results are any indicator of the upcoming season as a whole, this year is going to be a real doozy. More than half of the teams in the D-II rankings already have at least four losses, there are no undefeated clubs in the NAIA (although St. Andrews hasn’t technically lost to an NAIA school) and the few D-III schools who’ve actually made it onto a diamond haven’t look very imposing either. With so many early losses the rankings haven’t had too much of a shakeup so far because the losses are across the board. When one team unexpectedly loses a couple of games it’s difficult to move them down when everyone else around them is dropping games as well. Nevertheless, here are the rankings as they currently stand nearly a month into the season. Rankings are based on games through Sunday, February 24. 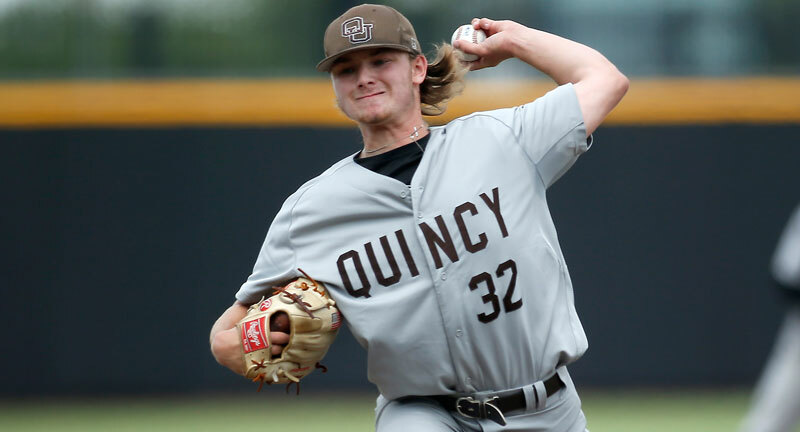 One of the most impressive openings to the season belongs to the Quincy Hawks. After taking two of three from Gulf South Conference favorite Mississippi College on the road, the Hawks followed it up with three consecutive shutouts wins last weekend, as they held West Liberty and Malone scoreless over 27 innings. With the wins the Hawks move into the top five of the Perfect Game rankings for the first time, vaulting three spots to the No. 4 position. Their immediate success this season is hardly a surprise as Cody Birdsong, Chandler Purcell, Michael Nielsen and Nolan Snyder give head coach Josh Rabe – a former two-time All American at QU himself – a solid quartet of top-shelf experienced everyday players with their sights on reaching the 40-win plateau once again. Birdsong, a consensus All-American last season, is arguably D-II’s top second baseman as he hit .353 with 17 doubles and 14 home runs in 2018. Purcell was a GLVC First Team All-Conference honoree himself after batting .345 with only 13 strikeouts in 174 at-bats, Nielsen had double-digit home runs and batted .315 while Snyder hit .333 in 50 games as a sophomore in 2017. They’ve also added Cole Evans, an imposing physical specimen who excelled at top community college Iowa Western last season. Despite that daunting offensive everyday lineup, it’s the pitching that has prevailed so far this season. Riley Martin, who already has two wins this season after holding Malone scoreless last weekend, had a 2.83 ERA in his 57 1/3 innings last year. Nick Stroud, who spearheaded the second shutdown of the Pioneers, struck out a team-leading 82 batters in 57 1/3 innings last season. That starting duo is just as formidable as any pair in the nation. The Hawks also have two other pitchers back from last season who started 10 games. Riley Martin had a 2.83 ERA last season and had been the most dominant so far this spring with a 0.75 ERA in 12 innings. Senior Aaron Stone, who threw 69 innings last season and had a 3.50 ERA, rounds out the rotation. A team going the opposite direction this season had been UNC Pembroke. The Braves, who returned five everyday players from a team that finished in the top three in batting average and runs last season, has floundered out of the gate, losing their last six games after winning five of their first six. It was known that the pitching staff, despite being experienced, had some soft spots, but their opposition has been mauling them early. If you take away the impressive numbers of Nile Ball, who had thrown brilliantly with 27 Ks in 24 innings and has a 2.62 ERA, the staff ERA is well over nine runs per contest. The Braves remain in the Top 25, but tumble mightily from No. 3 to 18. They certainly haven’t been playing like one of the nation’s elite, but the potential is still there for a big season so they haven’t been written off yet. Entering the rankings for the first time this season are the Catawba Indians. They’ve started the season winning 12 of their first 14, which includes victories over the aforementioned Braves as well as Mount Olive. Dropped out: West Florida (20). The top-ranked Southeastern Fire lost a game last week, but it was to the Detroit Tigers so they get a pass. SEU, along with much of the rest of the top 10, remain largely intact, although there is a bit of jumbling. The most noticeable movement in the top 10 was the expungement of William Jessup who split a series with Westmont. Both teams now sit soundly in the middle teens. It was a memorable week for the Taylor Trojans who made a mini-move up in the rankings, moving up a spot to the No. 23 position. Sophomore Drake Gongwer threw a seven-inning no-hitter over IU South Bend, the first in 15 seasons for a Trojan pitcher. For the season Gongwer has pitched 19 2/3 innings and only allowed a measly six hits with 25 strikeouts. Also continuing to put up impressive numbers is the odd tale of Taylor speedster Kyle Kelsheimer. The last two seasons Kelsheimer has made his way into 84 games but has only accumulated a pair at-bats. His sole role is to be a pinch runner and steal bases. Over the past two seasons Kelsheimer has stolen 42 bases while only being caught three times. So far this season he’s already added nine to his total. His unique roleis one not seen since the mid-1970s when Herb Washington was the Oakland A’s “designated runner.” Washington appeared in 105 games for the A’s and was a far less successful base thief than Kelsheimer as he was only successful in 31 for 48 attempts. Bellevue is once again having an un-Bruinlike start to their season. After starting 2018 in the top five, the Bruins failed to shake off their winter hibernation and started the season a dismal 7-11. This spring their results have been even more bemusing. Their record is 4-7, yet they can claim wins over USAO and Oklahoma City, a pair of clubs that have gone a combined 28-2. Nevertheless, Bellevue also has losses to Texas A&M-Texarkana and Briar Cliff, a couple of clubs that the Bruins should’ve handled with ease. BU has also lost a pair to Central Methodist, a quality club that was the last team out this week. With the losses Bellevue was dropped from the Top 25 this week (they’ll have ample opportunity to make it back with games against Keiser, Webber International, St. Thomas and Madonna) to make way for Lyon. The Scots started the season with a series win over always-formidable Oklahoma Wesleyan and have won their last 12 in a row. There still hasn’t been much on-the-field action at the D-III level with 11 of the teams in the Top 25 having yet to play a competitive game. The Rowan Profs certainly looked worthy of being the top-ranked team to start the season as they absolutely manhandled the Stevens Ducks 25-3 in their season opener. Only one Rowan starter failed to get a hit, but he did manage to score thrice due to getting on base via walks and a fielder’s choice. The Profs should have a much tougher row to hoe this week with a pair of games against fourth-ranked Randolph-Macon on the schedule. Spaulding swept Case Western Reserve and took their spot in the Top 25. The Eagles also had an impressive win in their season opener against UW-Whitewater to start the season. It was another school with an avian mascot that Spaulding edged for the rankings opening. The Huntingdon Hawks have started the season 9-0 and also have a win over UWW as well as a bottom-of-the-ninth win over Spaulding. Nevertheless, Spaulding gets the nod for now with the Hawks waiting in the proverbial wings. Dropped out: Case Western (25).